context. However, a closer look into the institutions will tell us that they deal with manga in very different ways. For example, there are ‘manga art galleries’ which conceptualise manga as an art form, and equate it with original artwork; ‘manga museums’ which deal with manga related materials as historical artefacts; and ‘manga artist memorial halls’ which focus on a single artist as a celebrated local figure. Yet it remains true that in our everyday lives, manga as a medium takes the format of a book, and so these institutions can be conceived of as ‘manga libraries.’ Such combination of museums and popular culture, often referred to as the ‘high and low’ of the cultural axes, is not a phenomenon a priori. It arouses interesting questions on the consumption of popular culture. What kind of a medium is manga when we see them in museums? How are manga generally consumed in Japan, and why should we have them in museums anyway? What do visitors do there? 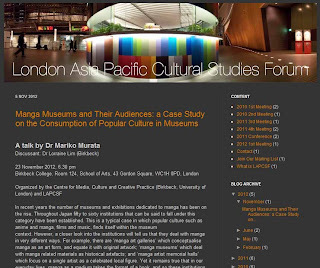 Looking into the results of the audience research that our research group has conducted over the past years, I would like to discuss on what the blend of popular culture and museums can bring to our society today. Mariko Murata, PhD, is an Associate Professor at the Faculty of Sociology, Kansai University, Japan. She is currently a Visiting Scholar at Birkbeck from September 2012. Her research is on ‘museums as media’, or media and cultural studies on museums. She is interested in the differences and the negotiations between Japanese museums and Western museums in the age of globalization and popular culture. One of her latest topics is about ‘manga’ (Japanese comics) museums, which she will be presenting at the meeting.